The Lenormand Heart card is about love, happiness, passion, joy, and fulfillment. While it can represent romantic love, it can also represent the love parents have for their children, siblings have for one another, or you have for a friend. The Heart also means the kindness and generosity you show to others, whether it's to a charity, friends, or strangers. 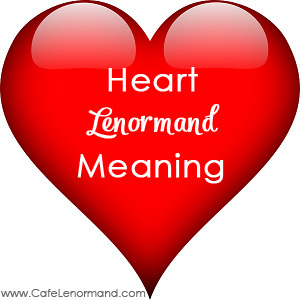 The Lenormand Heart Meaning in Love: The Heart card indicates a loving relationship. It can represent a new love, falling in love, or romance. However, the Heart is not the card of marriage or commitment. That's the Ring. The Heart Meaning for Career: The Heart represents a love of your career, enjoying what you do, and satisfaction with your job. It shows a jovial work environment where people generally get along. The Heart card may indicate an office romance. In terms of a job, the Heart usually represents humanitarian work, philanthropy, or charity work. The Lenormand Heart Meaning in Health: The Heart card is connected to anything involving the heart. Using the Heart for Timing: The Heart can represent Spring or the 24th of the month with the former being the more common meaning. When was the last time you let those around you know how much you appreciate them? How can you show yourself more love? What can you do to bring some joy and happiness to another? What passions would you like to pursue? Are your actions coming from the heart? How can you be more open, trusting, and loving towards others?